I went to buy some felt for Sonic toys, and saw Darling yarn by Katia. Just couldn’t resist, I’ve wanted similar yarn for long now. So I took all they had – 6 balls in my favorite blue-green colors, came home and realized that I had no clue what to make with this yarn. I started searching Ravelry, and when I saw Bloomsbury Top by Tammy Hildebrandt, I new it would be perfect. I did a few swatches to decide which size to make and which crochet to use. 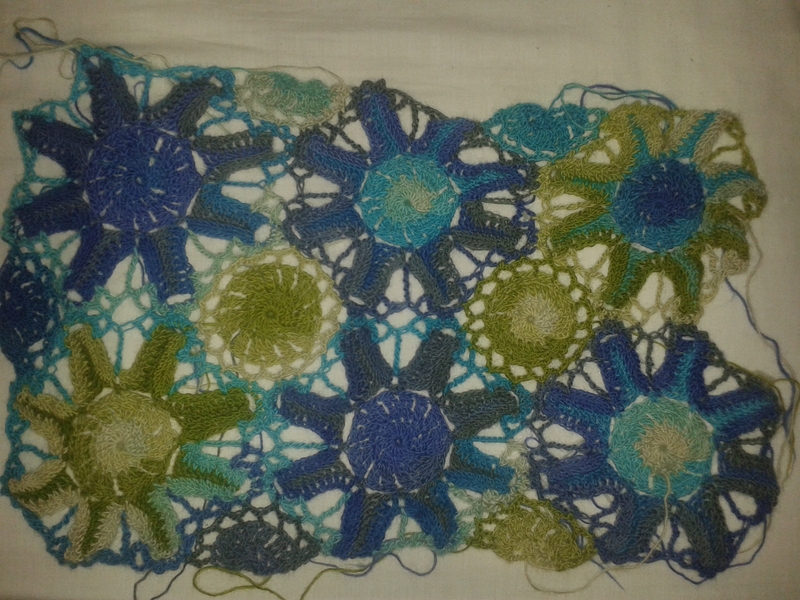 It’s a pity pattern doesn’t say finished sizes for each of the flowers. Would have made it easier for me to decide. In the end I chose to make large flowers with a smaller hook an am hoping it would fit. I really enjoyed making the flowers. For me, there are normal patterns, stitch patterns that I hate (or find just boring), and think there are patterns that I really enjoy, as if my hands loved the movement required to make it. This how it felt making the flowers. I started getting a bit bored by the 11th flower, but then you only need to make 12. So it’s just perfect. The front and the back were ready in about a week. That’s the thing about crochet, it can go really fast, compared to knitting. I had to play a bit with colors, as I found that I could only get two color sequences if I did nothing, so for the front panel I did joining motives after each two flowers to break the monotony. I hate weaving ends, but this time I did it pretty quickly as I want this so much to be done! I just hope that they will stay in place. Usually my end slip out and start showing really quickly and that’s very annoying. I tried to do my best, and hope that yarn will help, as it’s really clingy and hard to unravel. Separator image Posted in My kniting & crochet and tagged with bloomsbury, crochet.